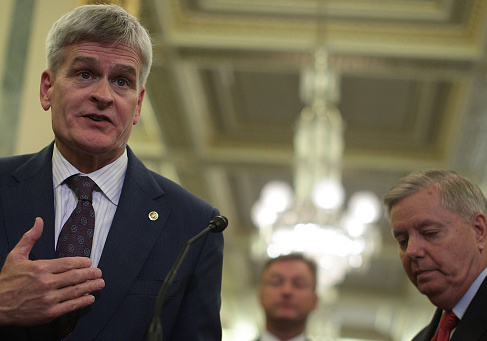 The Graham-Cassidy bill, the GOP's current replacement to the Affordable Care Act, is estimated to reduce the deficit by $133 billion from 2017 to 2026, according to the Congressional Budget Office's scoring of the legislation. The legislation's projected savings are a result of a reduction in Medicaid spending, the elimination of subsidies, and funding for block grants. The bill repeals Obamacare's mandates, keeps some of the taxes, and spends $1.2 trillion for new block grants to states from 2020 to 2026. The CBO estimates this is $230 billion less than the subsidies that would be paid for under Obamacare. "That reduction in subsidies would be partly offset by the repeal of penalty payments from the individual and employer mandates, which totaled about $200 billion over the 2020-2026 period," the budget office explains. "The net result of those flows—providing the new block grants and eliminating those subsidies and penalties—would be to reduce the deficit even if all of the grant funding was spent by 2026." The grants to states could be used in different ways—reducing premiums, helping individuals buy nongroup coverage, reducing out-of-pocket costs by helping pay for copayments and deductibles, giving payments to providers, providing Medicaid benefits, and establishing a program to provide health care for those who are not eligible for CHIP or Medicaid. The budget office says that through these block grants, states will have flexibility and the ability to adopt successful practices. "The flexibility afforded by the new block grants would allow states to experiement with different ways to cover health care costs," the budget office states. "States would learn from one another, and over time, they would adopt practices found to be successful elsewhere that supported their goals for subsidizing coverage." While the budget office says that millions would not have insurance under the legislation, it notes that one reason for this is because individuals would not be forced to purchase insurance. "The number of people with comprehensive health insurance that covers high-cost medical events would be reduced by millions compared with the baseline projections for each year during the decade," the budget office states. "Enrollment in all types of health insurance would be lower because penalties for not having insurance would be repealed." The other reasons for a reduction in the insured are lower enrollment in Medicaid because of reduced funding, and lower enrollment in nongroup coverage because of reduced subsidies. The budget office says programs set up by the block grants and employer-based coverage would cover individuals that would partly offset this reduction in coverage. The legislation also provides $10 billion in 2019 and $15 billion in 2020 to health insurers to stabilize premiums and encourage participation in the nongroup market. While other CBO reports have detailed information on how premiums would increase or decrease based on the legislation, the budget office says they need more time to calculate those estimates. "CBO and JCT would need at least several weeks to provide point estimates of the effects on the deficit, health insurance coverage, and premiums," the budget office said. "During that time, the agencies would gather and analyze more information about states’ potential uses of the block grants and the extent to which states might modify rules governing the nongroup market." Sally Pipes, president of the Pacific Research Institute, says that while there are reasons for Republicans to object to the bill because it keeps portions of Obamacare in place, the latest CBO score is not one of those reasons. "The CBO's latest score was merely a preliminary analysis," Pipes says. "The CBO explicitly stated that they ‘would need at least several weeks to provide point estimates of the effects on the deficit, health insurance coverage, and premiums.' In other words, the CBO needs more time to draw an educated conclusion about the effects of the GOP's latest reform bill." "What's more, the CBO's past predictions have been far from accurate," she said. "In 2014, the CBO predicted that 24 million people would enroll in Obamacare in 2017. In reality, only half that number bought exchange plans. And an additional two million of those eventually dropped coverage because of skyrocketing premiums." Pipes added that "the CBO also uses unrealistic, outdated projections that grossly overestimate future Obamacare enrollment. So even if everyone who currently has insurance maintains coverage under Graham-Cassidy, the CBO would report Graham-Cassidy causing millions to lose coverage compared with Obamacare." This entry was posted in Politics and tagged Bill Cassidy, CBO, Lindsey Graham, Obamacare. Bookmark the permalink.